Our Danube boat and bike tours in Austria, Germany and Hungary feature the cruise ship MS Normandie. Our accommodation on the 101 passenger capacity ship is based on an outside-facing 2 bed cabin on the lower deck with private facilities and air-conditioning. We are pleased to discuss details on request. The other vessel operating on our Danube bike and boat holidays is 101 passenger capacity boat MS Arkona. Technical details: Length 91,2 m, width 10,50 m, depth 1,60 m, max. 100 passengers. Your accommodation: This is in a standard, outside-facing two berth cabin on the lower deck. Cabins are available on the upper deck (supplement payable). MS NORMANDIE has 49 x 2-bed cabins and 2 x1-bed cabins. All 2 bed-cabins (10-11 m2) are equipped with two lower beds; one can be folded against the wall during the day. Cabin facilities include: shower and WC, hairdryer, TV, safe (deposit), individual air-conditioning and picture window. Only windows in the upper deck cabins can be opened. Single cabins: 1-bed cabins (approx.7 m2 ) have one lower bed and are otherwise equipped with same features. 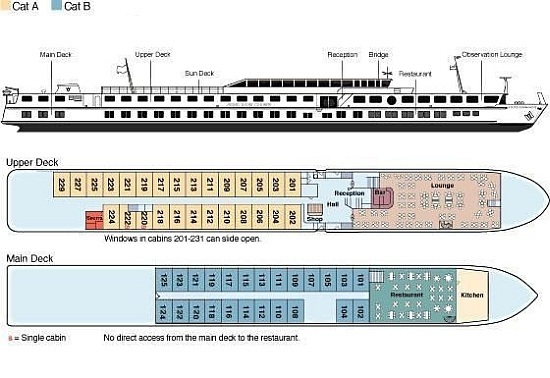 On board facilities: These include an upper deck panorama lounge with bar and a small sauna (advance booking at the reception only); on the main deck, a comfortable restaurant (no direct access from the cabin-zone), plus chairs and ordinary chairs and tables on deck. On board activity programme and optional excursions programme. Important remarks regarding routing/program: The MS Normandie shipping company reserves the right to make changes of routing and program. In case of flood or low tide, it reserves the right to bridge parts of passages by buses and in extreme situations, reserves the right to cancel the journey on short notice. No legal right shall be constituted of both situations. (Water level is force majeure). The same applies for officially ordered – previously not announced – repair work on locks or bridges or in case of undeserved breakdown of engine or power unit. Please be aware that a cruise ship on the Danube is not only your hotel but also a machine, working with engine power also during the night. Especially crossing locks and bridges – and the preparation work – may cause noise. If you are sensitive please bring your own ear plugs.